South African President Cyril Ramaphosa has expressed his condolences following the passing away of struggle icon Zondeni Sobukwe on Tuesday, the presidency has said. 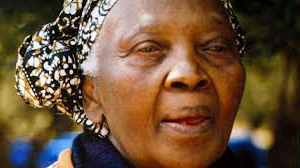 “The loss – as the country celebrates Women’s Month – of Mama Sobukwe is a sad loss to the Sobukwe family and our nation at large. “We have lost a heroine of resistance and a fighter for the freedom of all South Africans, who continued her activism into our democratic dispensation. We will always remember and honour her extraordinary contribution,” Ramaphosa said. Sobukwe, aged 91, died in the early hours of Wednesday, the presidency said. This year also marks the 40th anniversary of the death of her late husband Robert. She was the wife of Pan Africanist Congress founding President Robert Mangaliso Sobukwe. “President Ramaphosa’s thoughts are with the Sobukwe family, the Robert Mangaliso Sobukwe Foundation and the leadership and membership of the Pan Africanist Congress,” the presidency said.